Peaceful moon or sunny side up, gentle tapping transports us to paradise. Bamboo gives our Asli Arts chimes a mellow, musical and enchanting sound unlike any other chime. A linear design gives this chime a unique look and allow it to hang right next to the house. 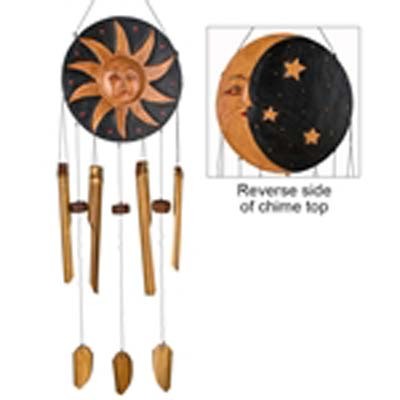 Bamboo gives our Asli Arts chimes a mellow, musical and enchanting sound unlike any other chime. Our chimes are made with pride by craftsmen of Bali and Vietnam. Each piece is individually carved and painted. Non-endangered wood, coconut shell, recycled metal and bamboo are used to make these instruments of nature. In addition, each chime is hand-tuned by musicians. Testing the sound of each tube, our musician-craftsmen create chimes that sound as good as they look. By hand-tuning each tube and selecting a range of sizes, each chime produces a unique melody of tones. Our chimes are sealed with varnish. To maintain their beauty we suggest varnishing each season and protecting during harsh weather. Small cracks are normal in bamboo. To avoid large cracks and fading, do not hang in direct sunlight or near heaters. As each chime is hand-made individual variations may occur.